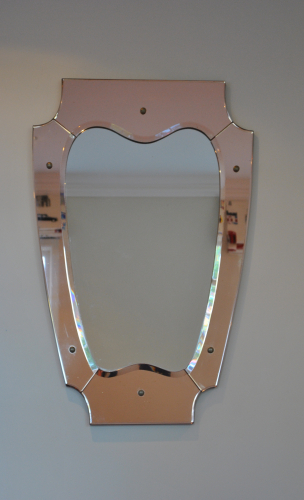 Very pretty shield shaped mirror by Luigi Fontana (Fontana Arte), Italy 1940`s. Sculpted and bevelled rose glass surrounding mirrored plate. Original brass fixings. Gio Ponti was Art Director of Luigi Fontana and combined the business with Pietro Chiesa to form Fontana Arte.